Home > Blog > How to Succeed at Franchise Shopping? Seven Mistakes to Avoid. How to Succeed at Franchise Shopping? Seven Mistakes to Avoid. A great way to go into business for yourself is purchasing a ready-made franchise. Many potential business owners fall for some of the classic errors when choosing a franchise. In order to have a good start, avoid these seven potential blunders that could destroy your brand new business. Falling for the hype. You have to think of franchises as if they were any other product. You have probably seen ads talking about how one franchise is a guaranteed success, but a franchise is a business venture, where there is no such thing as guaranteed success. Some franchises are better than others, but there are no instant successes. Failing to do market research. Getting excited about a franchise that interests you is natural, but don’t overlook market measurements. Even though it looks exciting, it could end up to be a huge mistake if you don’t do your research. Buying the next big thing. Buying the newest smart phone can be a good thing, but buying the newest franchise might not be. It can be pretty risky to throw away the biggest benefit of buying a franchise – the proven record of a seasoned brand name—by going with a brand new franchise that doesn’t offer the benefit of name-recognition. Going in without an emergency fund. From the moment you purchase the franchise, you are responsible for the franchise costs, any fees or royalties, or any debts to the franchisor. Even though it is the franchisor’s job to advertise and market, you will need a back-up emergency fund to prepare for the possibility of a dip in profits. Entering the business without an exit strategy. Know the conditions of the contract before signing over your money. What happens if you want to close the business before the contract ends? What if the business goes bankrupt? Dealing with issues like these is far more difficult if your contract greatly limits what you can do. Not hiring a franchise advisor. Buying a franchise is a several thousand dollar investment. Don’t try to skimp on legal counsel. An experienced franchise attorney will help you negotiate clearly and to your advantage. Assuming that the franchisor is a friend. Not everyone wants what is best for you. A franchisor will do what is best for him, and that will not always be what’s best for you. Opening a franchise is a great way to own a business, but choosing which one to place your trust in is not easy. There are far more mistakes to be made than are listed here. Seek legal counsel from an experienced Mesa franchise attorney to help you make a smart decision when purchasing a franchise. 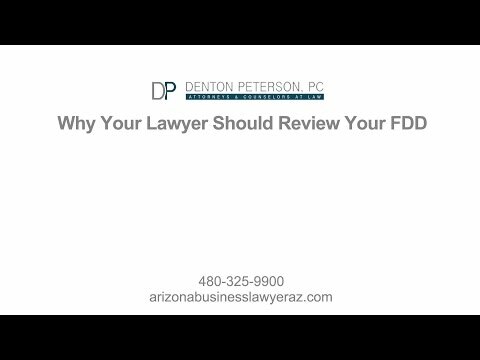 Denton Peterson PC has years of experience in representing our clients in all legal franchise matters. Contact us today to learn more.